4.75 in. High x 3.25 in. Long x 2.75 in. Wide. Made of Solid Brass with Pre-Drilled Mounting Holes. Metallic Gold Finish Complements a Variety of Styles. A Great Place to Hang and Organize Your Towels, Jackets, Bags and More. Perfect for the Bath, Bedroom or Entry Area. 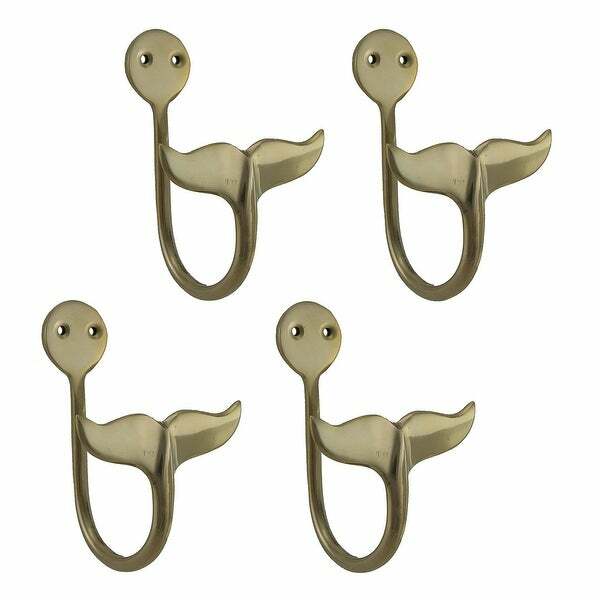 Give yourself a playful place to hang and organize your things with this four piece set of brass whale tail hooks hanging on the wall. We'll tell no tales, they're a great match with most any decor. Two pre-drilled holes make mounting to the wall so easy! They'll lend their coastal charm to any room, and they work great as towel hangers in the bath. They're made of solid brass and measure 4.75 x 3.25 x 2.75 inches. They're a great place to hang your jacket near the entry or robe in the bedroom. Use them all in one room, or place them in different rooms, you're sure to find just the right place for them.